My recent post on Realistic Blissey Counters generated quite a few comments on reddit. Most of these comments had to do with the way Overall rating was calculated.Overall rating is composed of 50% Power, 30% Combat Time and 20% Potions. The issue comes down to, how do you score combat time. The original formula I was using gives a very smooth curve from a score of 1000% at 6 seconds down to 100% at 50 seconds and then 50% at 100 seconds. This formula seems to work just fine for most battles but suffers from the ‘Blissey problem’. Blissey on defense is most annoying in that she will time you out. Attack speed is even more important in this situation but the formula was saying the opposite. If the simulation says you will on average win in 95 seconds, you will often not do quite as well as the simulator or screw up in some minor way and you will lose! This means we need to penalize anything over about 90 seconds very strongly. The other issue is that there was not enough of a penalty for finishing in 100 seconds vs 50 seconds. Pretty much everyone agrees, finishing in 50 seconds is more than twice as good as finishing in 100 seconds. In fact anything over 50 seconds should be very heavily penalized. 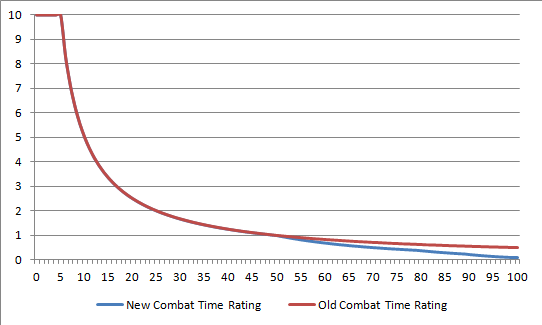 So after taking this into account, I started playing with the formula for Combat Time Rating. First I added a drop off at 50 seconds that will penalize slow attackers. I then made the penalty even worse at 78 seconds and 88 seconds, dropping the score for 100 seconds by a factor of 5. Importantly, there are no big drops in the rating so there is never a big difference if the battle takes one more second. It is still a smooth curve, but it has 3 inflection points where it declines more rapidly. While there is probably a better formula for creating the curve I wanted from 50s to 100s, this one works well and is cheap to calculate which is important as well. Here is a zoomed in view of the curve from 50 seconds to 100 seconds. The penalty for being slow is significantly worse than it was before. Also not shown, but the penalty past 100 seconds stays capped at 10% while as before it would continue getting worse. In addition to the above changes, I also increased the number of simulations performed from 100 per battle to 200. This really cranked up the amount of time it took to generate the results but the numbers are much more consistent between runs. Note that due to the random nature of these simulations, the numbers will always shift around some! The Overall number can shift +-2% each run so small differences should not be considered significant. As you can see, the rankings shift around quite a bit with the change. Snorlax drops 4 spots due to being so slow while Machamp moves up to #4. Steelix drops all the way off the list (below 24). Dragonite and Flareon move up quite a bit due to being among the faster options. Vaporeon drops all the way down to 9 and Exeggutor shows up on the list at #8. All in all I am happy with the changes, I hope you are too! Now lets see what happened with the dodge all version. Note that Pound/Dazzling Gleam and Pound/Hyper Beam both did better than Zen Headbutt/Dazzling Gleam as before on this so if you are in the simulator, make sure to select the correct moveset! Once again slow attackers like Muk, Foretress and and Vaporeon went down quite a bit while faster pokemon including some glass cannons shot up in the rankings. Dragonite got a bit luckier this time around in the simulator with Dragon Breath/Dragon Claw (if you are so lucky as to have one) doing the best this time. New on the list Charizard, Arcanine and Espeon show up as servicable attackers if you dodge all the attacks. Yep 28% of your life in one hit, that’s going to hurt. The improvements in the simulator are definitely showing their worth as the real world back to back Dazzling Gleam is apparently happening ALL THE TIME in the simulator now. So was the change to Combat Time Rating perfect? I don’t think so. I think Snorlax probably deserves to be slightly higher as he’s the only one who can beat Blissey without dying if you take into account missing dodges. Sure he’s borderline going to time you out but I’m fairly confident he can do it, especially since realistic dodging is VERY real world spam friendly. I am happy overall with the changes though and I’m definitely going to keep them. The extra simulations increased the quality of the results but its still not enough to get truly stable results and I cant afford to run enough big servers on google cloud to do the 1000 or more sims I would need. Perhaps there is an optimization I can find though to speed things up. Will definitely be on the lookout. Realistic Dodging is worse at dodging than people on Reddit. Yep. It is. You are so good at this game! Why don’t you try 75% or 90% dodging instead :). That said, expect Realistic Dodging Pro coming soon that increases the dodge success rate especially for faster quick moves. Upcoming changes to gym combat will hopefully be easy to add to the simulator. Things like stat changes or new moves are trivial. Splitting defense and special defense would not be too hard. Adding status effects would be quite a bit harder. We shall see. I am sure I will figure something out. I always use Rydon. It always works for me. So much work for the benefit of fellow travelers. Thank you. Please label the y axis- Is it assumed win probability if Blissey has 50% life left? The y axis is the combat time rating that is plugged into the overall formula. Dragonite works best for me. Unfortunately I don’t own a Machamp with Counter	/ Dynamic Punch yet, would love to try him out in gym. To be honest I’m pretty surprised that Vaporeon is worse than Gyarados against Blissey. Why is that?